Father Alberto Cutie left the Catholic church to become an Episcopal priest -- and marry his girlfriend. 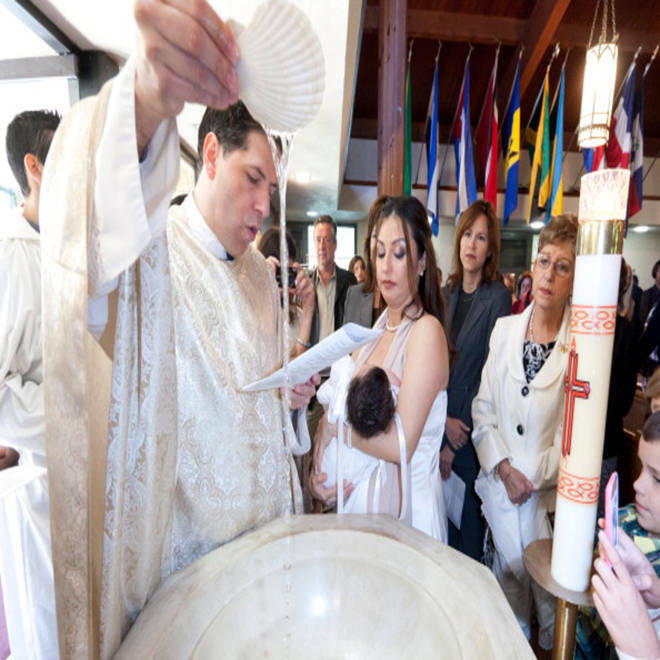 Here he's shown with wife Ruhama Cutie baptizing their baby daughter Camila Victoria in Miami, Fla.
More students in seminaries, more people in the pews, and the pitter-patter of little feet padding through the rectory. Is that what the Catholic Church would look like if it scrapped centuries of tradition and allowed priests to be married? Or would it lead to higher costs for parishes, conservatives running for the doors, and really awkward divorces? "So we're not only paying for family expenses, college, and all of that — now we're paying alimony, too?" Catholic author Mark Shea wondered. Pope Francis' number-two man suggests that the idea of doing away with priestly celibacy is open to discussion. NBC's Chris Jansing reports. When Pope Francis' No. 2, Archbishop Pietro Parolin, said last week that the church's policy on celibate clergy is up for discussion, some analysts saw it as a shift in Vatican thinking. Catholics have divergent views of what would happen if priests could accessorize their vestments with wedding rings. Proponents say it would energize an institution that is struggling with a shortage of priests and often criticized as behind the times and out of touch with modern life. "Gallup survey over Gallup survey have shown an overwhelming majority of Catholics support a married priesthood," said Sr. Christine Schenk, executive director of the progressive organization FutureChurch. Critics say the benefits would be small and outweighed by the headaches: the cost of supporting entire families instead of bachelors and potential fallout from marital problems. Shea noted that it's believed that U.S. Catholics divorce at the same rate as the general public — about 35 percent — and there's no reason to think priests would do better. "A priest going through a divorce in the middle of his parish is a massively blood-letting phenomenon," he said. "Half the parish is siding with the wife and half is siding with the priest?" 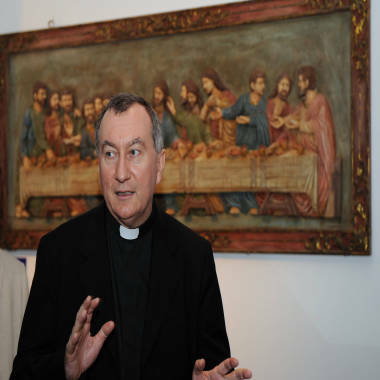 "NO ONE WANTS TO THINK ABOUT THEIR PRIEST DATING"
Vatican Secretary of State, Archbishop Pietro Parolin, said last week that priestly celibacy can be up for discussion. Eastern Orthodox churches ordain married men but divorces are "relatively rare," said Anthony Vrame, director of religious education for the Greek Orthodox Archdiocese of America. Sometimes, especially if infidelity was the cause, the priest may be asked to resign. In other cases, the priest is moved to a new parish so his former flock can heal its wounds. "In my experience working for the church for the last 25 years, when a priest's family breaks up for any reason, it's very traumatic on the parish," Vrame said. If the Catholic Church were to allow married priests, it could follow the Orthodox framework, which has two tiers. Men who want to marry must do so before they are ordained; those who don't remain celibate for life because, Vrame said, "no one really wants to think about their priest dating." Ninety-five of U.S. Orthodox priests are married, he said, though bishops are selected only from the ranks of the celibate. Would the option lead to more young Catholic men pursuing the vocation? The U.S. church has seen the ranks of priests decline from almost 60,000 in 1965 to just under 40,000 this year, according to the Center for Applied Research in the Apostate at Georgetown University. Some 30,000 American priests have quit because they wanted a relationship, according to Thomas Groome, a professor of theology at Boston College. The number worldwide may be as high as 125,000, Schenk said. "Many of these men would be very happy to be involved again in celebrating Mass on Sundays," she said. Catholic University sociologist Dean Hoge said in 2005 that half of all priests thought celibacy should be optional. In a 2007 study by the National Association for Lay Ministry, nearly a fourth of young men said they would find the priesthood more inviting if celibacy were not required, and Hoge said the restriction was the single biggest deterrent to recruiting more seminarians. Father Alberto Cutie — who left Catholicism after being caught with a girlfriend in Miami, became an Episcopal priest, got married and now has two kids — told NBC Miami that he's "much happier." "I can tell you everyday since I became an Anglican, the day I joined the Episcopal church, I've received an email, a phone call, or letter from a Roman Catholic brother who's thinking of making this transition that I have made," he said. A small portion of the Catholic flock is already tended by married men. Since Pope John Paul II extended an invitation in 1980, nearly 100 married Anglican priests have converted and started working in Roman Catholic dioceses. That's why Schenk thinks the rank-and-file, even those with a conservative bent, would not get hot under the collar over a reversal of the celibacy rule. Shea, however, said the laity should be concerned about another side effect of a married priesthood: red ink. Parishes with more than one priest could not expect multiple families to commune in one rectory, so they would have to pay for more and bigger housing. Priest salaries would have to be big enough to feed, clothe and educate any offspring. "The kids gotta go to college. Where does that money come from?" Shea said. "If we as lay people are gonna clamor for married priests then we bloody well better be ready to pay for it. Are we ready to do that in a down economy?" WHAT'S A HIGHER CALL: VIRGINITY OR MARRIAGE? FutureChurch says the financial concerns are overstated. In 2009, unmarried Catholic priests averaged $44,033 in salary, housing and food. Their married ex-Anglican counterparts received an average of $56,142 in compensation, and Protestant pastors averaged $57,132. "Catholic churches always find the money for what they need," Schenk said. But what the church needs remains a matter of great debate. Deborah Rose-Milavec, a lay pastoral minister who works with FutureChurch, said some disenchanted Catholics would see a new policy as a "sign of hope" that the Vatican is embracing openness and change. Couples attending Sunday mass would "feel more included" when the sermon comes from someone who can relate to their own situation, she said. Shea said that while celibacy is not dogma, there are solid theological reasons for holding priests to a different standard. "Is marriage good? Marriage is absolutely good," he said. "But virginity is a higher call."